Are you in need of a tree service company in Portsmouth, VA? Here at Virginia Beach Tree Service Pros, we offer a wide range of tree care services for all residents and business owners in Hampton Roads. Some of those services include trimming and pruning, tree and stump removals, and emergency tree services. If you find that you have a dying or dead tree on your property, or a tree that looks like it may have contracted a disease, it’s likely that you will need complete removal or continued maintenance service from a professional tree care provider. If you’re unsure who to call, be aware that there are a lot of options. So, how can you choose the best company to work with? Consider these factors. First, do some research on competitive rates. Many are under the false impression that using a professional is expensive. So they attempt to remove trees on their own, despite a lack of experience. But instead of risking your health and possibly damaging your property, it's better—and safer—to seek assistance from a qualified tree expert. Tree care is a highly competitive business, which has forced prices to come down. Consequently, tree cutting is no longer as expensive as you may think. Some quick research will show you that there are many companies with competitive and affordable rates. The best part is that low rates don't affect the quality of work, since so many providers are competing for customers. It's also important that you work with a company that has a good understanding of the local laws and environment. As someone with no or little knowledge and experience, you might not be in a position to understand all the local laws and regulations that govern tree removal projects. Many property owners who removed trees on their own have found themselves in trouble with the law because they didn't do what was legally required. The results were hefty fines and even expensive lawsuits. To avoid legal trouble, money wasted on legal issues, and a mountain of paperwork, it is wise to call in the professionals. Our local experts know the legal requirements and necessary procedures for the entire tree-removal process. This includes applying for any necessary permits and submitting all the required documents on your behalf. Additionally, you'll want to consider opting for professional tree care for insurance purposes. There are many risks associated with tree care. First and foremost, keep in mind that when you attempt to do the work yourself, you are not covered by any insurance to protect you and your property, leaving you dangerously exposed. You will be liable if your tree destroys your or your neighbor's property. 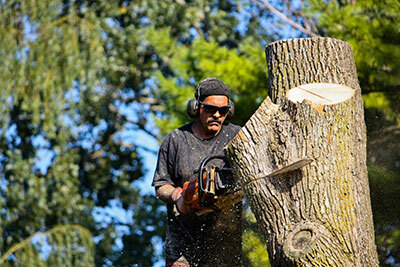 If someone gets hurt during the tree removal process, you will need to pay for all medical expenses. Should there be a lawsuit, you will have to pay for legal proceedings as well. Working with our team at Virginia Beach Tree Service Pros takes away these worries. With a reputable tree removal service in Portsmouth, VA—like our staff—you don't need to worry about lawsuits. Registered and certified companies have the necessary insurance to provide protection for both people and property in the event of an accident.